If you need to know how much data is regularly used across your network, a reliable bandwidth monitor is what you’re looking for. 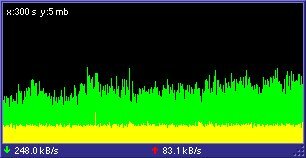 There are many situations where a bandwidth monitor is highly useful. Even if you think you don’t need one, we’ll explain why you should consider one. As of this writing, there are 206 internet providers which place a limit on their customer’s data usage. Once you exceed your monthly allowance, you either pay a fee or purchase additional data in blocks. If you subscribe to an internet service that limits your data allowance, knowing how much data you’ve consumed at all times is crucial. Most companies typically offer their customers a bandwidth usage meter, which is almost the same thing as a bandwidth monitor. However, the bandwidth meters from most telecoms only shows how much data you’ve consumed in a day, week, and monthly reading. All of the tools we’re sharing with you can give real-time usage report, which means you’ll know how much data you’re using by the second. For companies, knowing how much data your entire network uses is also important, because it could save you money. You might be paying for a higher data plan than what your office actually uses. By knowing exactly how much data your entire network consumes, you can adjust your company’s internet plan as necessary. If your office network is consuming far more data than it should be, a bandwidth monitor can pinpoint specific devices which are consuming the data. It may turn out that an employee is using the office network for downloading large files on their phone or computer. Bandwidth monitors can be simple or complex. There are bandwidth monitors that are aimed towards IT specialists, and others that anyone can comfortably use. In this list, we will highlight some of the most popular bandwidth monitors which anyone can easily learn how to use. One of the most in-depth bandwidth monitors available, SolarWinds RTBM has a ton of tools at its disposal. Utilizing SNMP for polling multiple network interfaces (in real time), RTBM displays the current status of all network interfaces you add to it. It should be noted that SolarWinds RTBM is typically for enterprise customers who operate large, complex networks. It takes a bit more configuration than your average bandwidth monitor, but once properly configured, its simply one of the most powerful available. You can add individual devices to the software, using the device’s IP address. You can then monitor how much data each individual device is consuming on the network. This is a wonderful feature, as you’ll be able to know exactly who in the office is consuming the most data. Many bandwidth monitors operate on a seconds-based monitor, the average being 10 ~ 25 seconds per tick. With SolarWinds RTBM, you can set refresh values as low as 0.5 seconds, which gives you the fastest real-time updates in data monitoring. If you’re a small office owner who doesn’t quite need the power of SolarWinds RTBM, but still need to be able to monitor a few computers on the same network, Networx could be the right tool for you. This small and lightweight tool allows you to measure internet speed and bandwidth consumption for multiple devices, through SNMP. You can track specific connections, such as wireless or mobile, or all connections simultaneously. 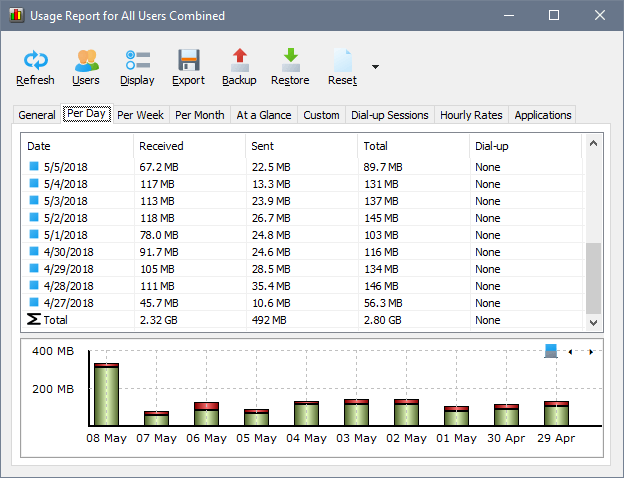 You can also set data quotas for a consumption limit, and it has numerous reports available to see how much data has been used across your connections. It has a 30 day trial, and the licensing fee is fairly cheap. 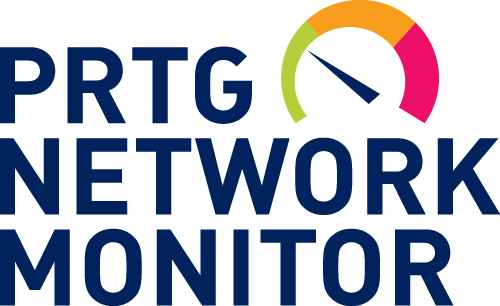 Another popular tool for complex network administrators, PRTG Network Monitor has a lot of in-depth features that make it a powerful tool. You can easily check traffic volume at an IP (level 3) level, while also checking events and counters on level 2 and 3. PRTG can also act as a packet sniffer for an overview of Layer 4 services. 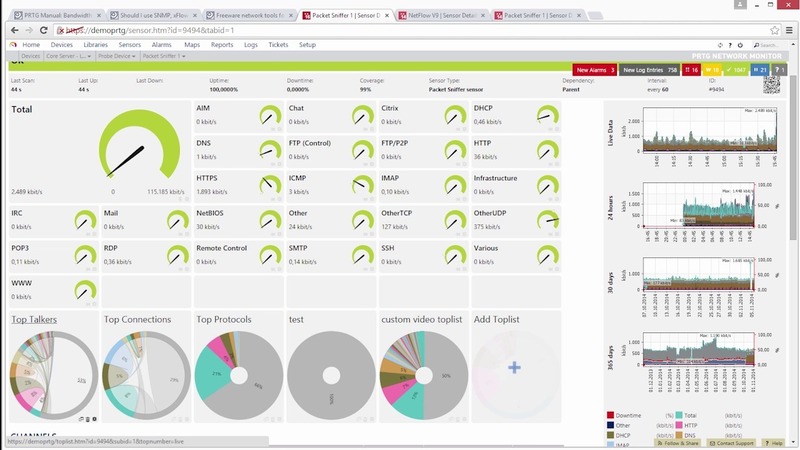 PRTG Network Monitor has an entire dashboard of tools at your disposal, including a bandwidth monitor. It operates by monitoring “sensors” on your network. These sensors include things like the CPU load of your server, traffic at a switch port, packet sniffing, SNMP, and a handful of others. As an enterprise-level software, PRTG nearly ties with SolarWinds RTBM in terms of features. There are a lot of comparison reviews out there, so you may need to do some research (and trial testing) before choosing one, if an enterprise-level bandwidth monitor is what you need. A free and open-source tool that should be perfect for simple data monitoring. BitMeter OS utilizes a web-based interface, which means you can monitor the tool through a web browser. Alternatively, you can use the command-line interface. BitMeter OS does not have a ton of features, but it covers the basics perfectly. When you launch the web-interface, you will see a graph that summarizes your network’s current download / upload rate, as well as the average and peak usage. BitMeter OS can display bandwidth usage history in minutes, hours, and days. You can set alerts for data usage, and it has a calculator where you can input file sizes to calculate how long it would take to upload / download files based on your current speed. What BitMeter OS lacks in a fancy GUI, it makes up for in getting the basic features of a bandwidth monitor just right. This makes it a great choice for users who don’t need a lot of bells and whistles, they just need a bandwidth monitor that gets the job done. 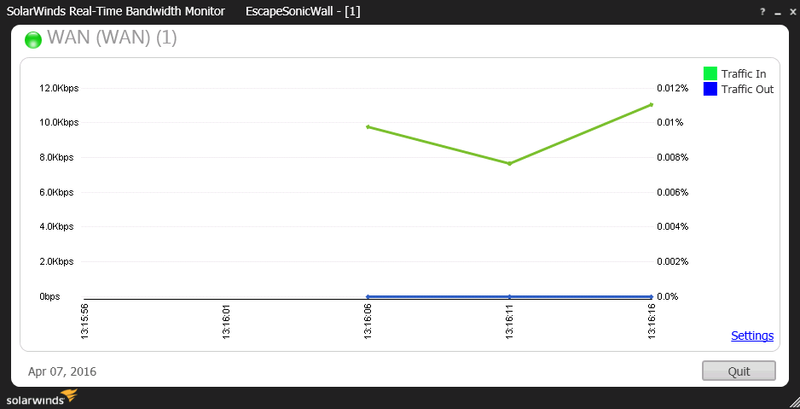 Specifically for Windows 10, FreeMeter displays a live graph that shows current network usage. The graph is customizable in appearance, and it can show reports for daily, weekly, or monthly data usage. It is quite a simple tool, and can be docked to your taskbar, or configured to always appear in a window. FreeMeter was written in .NET 3.5, and the interface is about as simple as you can get. Of all the tools we’ve shown so far, FreeMeter is perhaps the simplest in appearance, though it still offers useful features. It can monitor any network interface (or multiple), has built-in ping, trace, and UPnP utilities, and also has data quota alerts. Its pretty much perfect for someone who just needs a bandwidth monitor that runs in the taskbar, and alerts you when you’re near your bandwidth allowance.